LAUREL, Va. (AP) — A former Virginia firefighter accused of rioting at President Donald Trump's inauguration alleges her First Amendment rights were violated in her firing. PARIS (AP) — Carnival workers have gone on a rampage during a fourth day of protests in the French city of Le Mans over the location designated for an annual fun fair. SPRINGFIELD, Ill. (AP) — A major Springfield health care provider has donated land to what will be a memorial to the city's 1908 race riot. 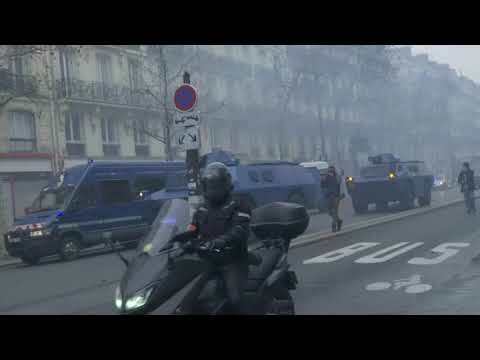 PARIS (AP) — A former French boxer who was filmed attacking riot police officers during the yellow vest protests has been convicted of assault. Christophe Dettinger, a former French champion in the light heavyweight category, was given a one-year prison sentence on Wednesday night. The judge brushed aside calls for a tougher sentence and gave the 37-year-old lenient terms that will allow him to work during the day. PARIS (AP) — A former French boxing pro who was filmed attacking riot police officers during the yellow vest protests is going on trial in France. Christophe Dettinger, a former French champion in the light heavyweight category, could be sentenced to up to seven years in prison in Wednesday's trial. The videos from the Jan. 5 incidents went viral on social media, triggering an outpouring of comments either praising him as a hero for the yellow vest movement or lambasting him as a vicious attacker. SPRINGFIELD, Ill. (AP) — Illinois members of Congress are seeking National Historic Monument status for the Springfield site of the 1908 Race Riots. ATHENS, Greece (AP) — Greek riot police have used tear gas to disperse state schoolteachers protesting violently in Athens, days after the country's public order minister accused officers of indiscriminately attacking teachers in similar circumstances. Anti-riot police are gathering outside Congo's electoral commission as the country awaits the first results of the presidential election. Several dozen officers are in the quiet street as midnight approaches. Some opposition parties are urging the electoral commission to release results as soon as possible after it delayed the announcement indefinitely on Sunday. PARIS (AP) — A man identified as a former boxing pro and suspected of viciously attacking riot police officers with his fists and feet during the latest yellow vest protests in France has turned himself in and was placed in custody on Monday, authorities said. Thousands of people are marching in downtown Barcelona to press their demands for Catalonia's independence from the rest of Spain. BARCELONA, Spain (AP) — Thousands of pro-independence protesters angry about Spain's Cabinet holding a meeting in Catalonia blocked roads across the region Friday and clashed with anti-riot police in its capital. A dozen protesters were arrested, and scores were injured during the clashes, the regional Mossos d'Esquadra police said after the meeting in Barcelona finished. BEIJING (AP) — China state media say 10 people have been charged with various offenses over rioting at a gathering of military veterans protesting for better benefits. It wasn't clear whether the suspects are veterans. However, the violence at the Oct. 4-7 gathering in the eastern city of Pingdu points to continued tensions between the authorities and ex-servicemen despite the establishment this year of a Cabinet agency to oversee veterans' affairs. French President Emmanuel Macron has stayed out of the public eye all week, leaving his unpopular government to try to calm the nation. In response, "Macron, resign!" 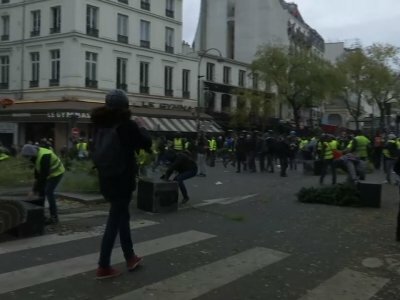 has become the main slogan of the "yellow vest" demonstrators. ATHENS, Greece (AP) — Protesters in Athens set up a massive burning barricade and pelted riot police with firebombs and rocks Thursday on the 10th anniversary of the fatal police shooting of a teenager, a death that sparked Greece's worst riots in decades. BARCELONA, Spain (AP) — Catalonia's regional government declared a landslide win for the "yes" side in a disputed referendum on independence from Spain that degenerated into mayhem Sunday, with more than 800 people injured as riot police attacked peaceful protesters and unarmed civilians trying to cast their ballots. DETROIT (AP) — It wasn't sweet music that brought Martha Reeves to the microphone at the Fox Theatre that day in July 1967; it was brutal reality. Headlining a string of shows for a hometown crowd, the singer of "Heatwave," ''Dancing in the Street" and other hits announced that rioting had spread through the city. Leave calmly, she said, and return safely to your homes.